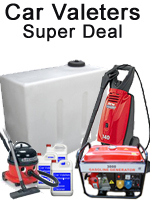 Here at Water-Tanks.net we have put together the ultimate complete car valeting kit. This kit is ideal for those car valeters who are starting up or looking to expand their work load. Included in this kit is Ecosure™ new 1050 Litre slimline water tank which is ideal for transporting large amounts of water as it is manufactured with "baffles" which break-up the flow of water, making it safe for transporting.